Our name comes from the notion that the animal world is one full of wonderment. As children we often experienced the joy at seeing or doing something new for the time. Perhaps you remember the first time you saw the ocean, or the mountains, or a skyscraper and you were filled with awe and wonder. As we grow older such experiences become fewer for us, but the Alaskan Klee Kai reminds us all that there is always something else to see or do. These little dogs give a sense of wonderment to those around them. It is in honor of this that we selected our name. We are a very small kennel whose goal is to produce physically and emotionally healthy puppies inline with the UKC breed standard. 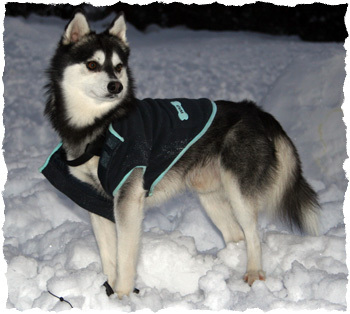 By breeding only pairs that compliment each other and have passed all their health exams we hope that each new generation of Alaskan Klee Kai will be better then the last. All of our dogs must pass a breeding quality exam (also known as a BQE) and be found free of any hereditary or genetic defects before being bred. The exam includes full blood work (which includes liver panel, thyroid, and CBC), plus an exam by a qualified veterinarian that includes, eyes, skin, coat, bone structure, hips, knees, heart, lungs, and overall condition. Such an exam is performed yearly. Factor VII testing is done all dogs not born of parents who are both clear or normal. Breeding will only take place between two clears or a clear and a carrier. For more information on Factor VII please see the breed info tab. Males are not bred until they are least one year old and have passed their BQE and temporary OFA certifications. Our Females are not bred before 18 months and have passed their BQE and temporary OFA certifications. All breedings are supervised for the safety of the male and female. We keep records of all heats and matings. All AKK adopted from WOW AKK come with their shots up to date, wormed, a copy of their health exam performed by a veterinarian, UKC registration (when contractual agreements have been met), copies of their parents health certificates, micro-chipped, a bag of their food, photos of them and their parents, and support, encouragement, and advice from us as long as you want it. All AKK are sold under a contract which must be completed before full ownership can be transferred. The contract states that all pet quality puppies must be altered by the age of 7 months before full transfer of ownership can take place. Show or Breed quality puppies will be fully transferred to the new owner at one year of age when they pass their BQE or are altered. If a puppy was sold as Show/Breeder quality and does not pass their BQE, the owner can return the dog and exchange it for a new puppy. All dogs are guaranteed for one year against genetic defects unless started prior to adoption and up to an addition 2 years after that. Our Story begins in sunny southern California. I have always had a deep love and fascination with animals. While growing up my best friends were usually of the 4 legged, furry, or feathered kind. My parents had mild to severe allergies to basically anything non-human, so many of my critter friends came in the form of strays. 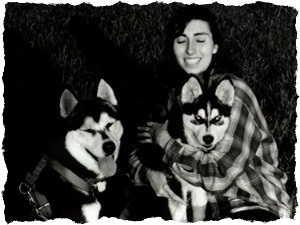 When I was 15, after much research and pleading (not to mention trips to the local animal shelter), I finally convinced my parents into letting me adopt a Siberian Husky. Siberian Huskies are known for being escape artists so adopting one at the pound should have been easy. They are, however, extremely popular. After a year of waiting, combing the shelters and being on waiting lists at rescue groups I decided to buy a puppy instead. A few weeks later Natasha joined our family. She was a holy terror! But we loved her. Still a decade later she is one of the sassiest creatures I have ever known. We loved her so much in fact we decided to get a second one. Tosh and I spent hours in the evenings at the park just running and playing in the grass but while I was at school she was so lonely. So a friend to play with seemed like a great idea. When Tosh was about 2 years old, Sha'uri (pronounced shur ee) joined our family. Ever since I was a little girl I had wanted to work with animals. So when a chance came for me to become a certified animal trainer I jumped at it. Upon completion I was ready to train my demo dog. After you've met my parents you'd understand why I couldn't use one of the Huskies. So the search began for a breed that wasn't 50 lbs like the sibs but was like them in every other way. 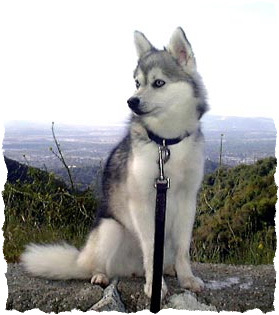 Surfing around on the internet researching dogs, I saw a picture of an Alaskan Klee Kai.The picture below is the first glimpse I had of an Alaskan Klee Kai. Her name is Kika, owned by Desarie Fletcher, who I actually ended up meeting just a few months later. Kika is still one of my favorites. 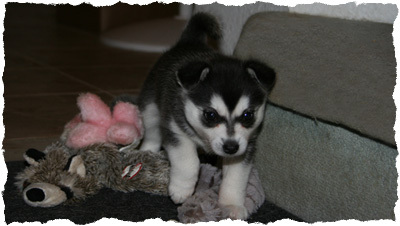 In March of 2005, Kukai, a little black and white male Klee Kai came to join our family. The huskies loved him! Especially Sha'uri. Before Kukai came to live with us Shar had carried around these little stuffed animals as her babies. Once Kukai joined the family he became her baby. To this day she still considers him her baby. With Kukai a love affair began. Not only of working with the dogs but showing them as well. The more research my family did and the more we learned about the breed we discovered that we had an opportunity to make a lasting contribution to the future of this breed. Soon after Alyeska came to live with us. The rest as they say, is history! * Adult dogs are CERF and OFA certified as clinics are available.